The political arm of a controversial company that wants to continue operating private prisons for the federal government has dramatically increased its donations to Senate candidates. Those donations from the political action committee for the GEO Group, one of the nation’s largest private prison companies, have expanded sixfold this campaign season, compared to the 2012 cycle, from $22,000 to around $136,000. That’s based on a Roll Call analysis of the most recently available campaign contribution data from the Center for Responsive Politics. Many of the recipients support initiatives that are important to the for-profit prison industry, such as an immigration overhaul. While the Justice Department has announced that it is phasing out the use of private prisons, the Department of Homeland Security and Immigration and Customs Enforcement continue to use such facilities. Among those recipients are three members of the “Gang of Eight,” who in 2013 worked on comprehensive immigration legislation. Sen. Marco Rubio is one of the biggest recipients of GEO cash. The Florida Republican has received $78,400 from individual GEO employees and from its political action committee, GEO Group PAC, since 2010. The company has also donated extensively to Rubio-affiliated PACs. GEO&apos;s PAC donated $5,000 to Rubio’s leadership PAC, Reclaim America, in 2014. And in 2016, it gave $50,000 to the Florida First Project, which supports Rubio’s Senate re-election effort. Also in 2016, it gave $100,000 to Conservative Solutions, which supported Rubio’s unsuccessful presidential bid. The GEO Group, based in Boca Raton, Florida, currently operates six detention centers in the state. In addition, Rubio’s former chief of staff, Cesar Conda, is a founding principal of Navigators Global, which has lobbied extensively for the GEO Group. Conda said he himself has never lobbied for the company. According to lobbying disclosure forms from the Office of the Clerk, Navigators Global has received $1,290,000 in income since 2011 while lobbying for GEO in Congress. Rubio did not comment specifically about the contributions he’s received from GEO. He said he hadn’t read the Justice Department’s report that led to its decision to no longer use private prisons. “If there’s validity to it, then I’ll be for it, but right now, I haven’t read the report,” he said. Two other ”Gang of Eight” members, Republican Sens. John McCain of Arizona and Lindsey Graham of South Carolina — have also received GEO contributions. McCain got $1,500 from the group in the 2016 cycle. Graham collected $1,000 during his 2014 run for re-election. And the GEO Group has been bipartisan in its generosity. Florida Democratic Sen. Bill Nelson received $5,000 from the group&apos;s PAC in 2010, ahead of his 2012 re-election run. After the first presidential debate, when Democratic presidential nominee Hillary Clinton said she wanted to end the use of private prisons, Nelson was asked where he stood. “I don’t know off the top of my head but I’ll check it out and give it a reasoned answer,” he said. Caroline Isaacs, the program director at the American Friends Service Committee&apos;s Arizona office which monitors private prisons, said it makes sense for the private prison industry to target influential senators. Federal policies such as bed quotas, she said, could lead to more private detention facilities. “They’re not dumb,” she said. 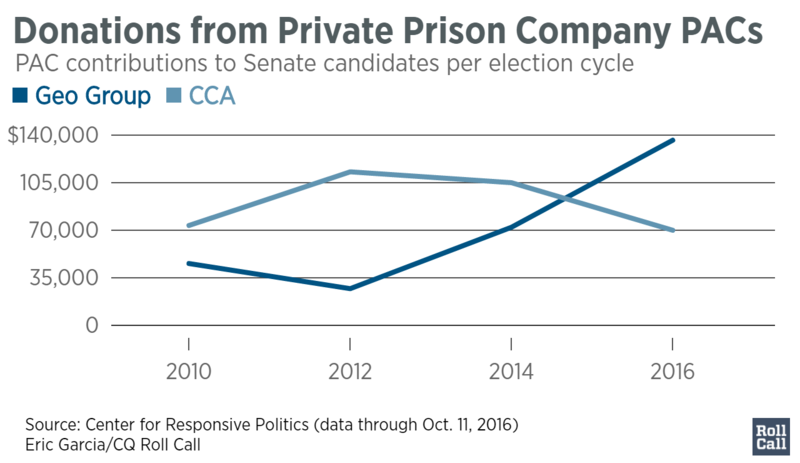 GEO’s main competitor in the for-profit prison sector, Corrections Corporation of America, has also contributed to friendly senators and candidates. But in recent years, its contributions have dipped. CCA’s contributions peaked in 2012, when its PAC handed out $113,000 to Senate candidates and their affiliated PACs. Recently, CCA has faced a series of troubles. In late September, the company announced it would eliminate 50 to 55 full time staff positions as a cost-cutting measure. Its stock price took a hit after the Justice Department announcement, and dropped further after Clinton called for ending private prisons. The Tennessee-based CCA has largely has given to the state&apos;s two Republican Sens. Bob Corker and Lamar Alexander. Alexander, for his part has a personal connection to one of the founders of the company — Thomas Beasley, who previously served as chairman of the Tennessee Republican Party, rented a garage apartment from Alexander while in law school. In addition, during Alexander&apos;s tenure as governor, he conferred with Beasley about alternatives to traditional incarceration, according to Tom Ingram, who served as Alexander&apos;s deputy and chief of staff and would later work as his Senate chief of staff. “Tom began talking to us when he first had the idea,” Ingram said. Alexander served as governor from 1979 to 1987. At the time, Ingram recalled, spending on correctional facilities was taking up a bigger part of the state budget. “We encouraged Tom to pursue his idea,” said Ingram, who now runs the Ingram Group, which, in the past, lobbied for CCA on the state, but not federal, level. Some Democrats who have previously received campaign donations from the private prison industry now express concerns. “We have this whole industrial complex of harsh sentencing, too many nonviolent offenders in prison,” said Sen. Sherrod Brown of Ohio, home to two private detention facilities. Brown received $1,000 in 2012 and $2,500 in the 2014 cycle from CCA’s PAC. His leadership PAC, America Works, got $5,000 in 2014 and $2,500 in the 2016 cycle. Similarly, Oregon Sen. Ron Wyden received $1,000 in both the 2014 and 2016 cycles from CCA. But earlier this year, Wyden introduced legislation to prevent for-profit prisons from using certain tax incentives. Ingram said the blowback on private prisons that culminated in the DOJ&apos;s August decision will ultimately put strain on the justice system. “If they look at the reality of that decision, they are going to have to find a lot of beds somewhere,” he said.